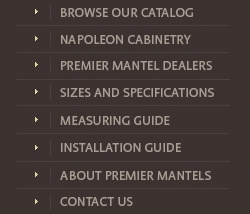 To insure the proper fit of your custom Premier Mantel use the following guidelines to measure your mantel. DETERMINING THE MANTEL OPENING HEIGHT "B"
DETERMINING THE MANTEL OPENING WIDTH "C"
DETERMINING THE RETURN DEPTH "G"
When you customize your mantel opening, you also change the overall Shelf Length "D", Body Width "E", and Overall Height "A". To determine your custom sizes, use the following table and formulas. SEE FIG. 2. Measure your B (Facing Height) and C (Facing Width) from Step 1 and 2 Example B = 39, C,51.